The Austin-Healey 100 is a sports car that was built by Austin-Healey from 1953 until 1956. It was developed by Donald Healey to be produced in-house by his small Healey car company in Warwick and based on Austin A90 Atlantic mechanicals. Healey built a single Healey Hundred for the 1952 London Motor Show, and the design impressed Leonard Lord, managing director of Austin, who was looking for a replacement to the unsuccessful A90. Body styling was by Gerry Coker, the chassis was designed by Barry Bilbie with longitudinal members and cross bracing producing a comparatively stiff structure upon which to mount the body, innovatively welding the front bulkhead to the frame for additional strength. In order to keep the overall vehicle height low the rear axle was underslung, the chassis frame passing under the rear axle assembly. Lord struck a deal with Healey to build it in quantity, bodies made by Jensen Motors were given Austin mechanical components at Austin's Longbridge factory. The car was renamed the Austin-Healey 100. The "100" was named by Healey for the car's ability to reach 100 mph (160 km/h); its successor, the better known Austin-Healey 3000, was named for the 3000 cc displacement of its engine. Apart from the first twenty cars, production Austin-Healey 100s were finished at Austin's Longbridge plant alongside the A90 and based on fully trimmed and painted body/chassis units produced by Jensen in West Bromwich—in an arrangement the two companies previously had explored with the Austin A40 Sports. 14,634 Austin-Healey 100s were produced. The first 100s (series "BN1") were equipped with the same undersquare 87.3 mm (3.4 in) bore and 111.1 mm (4.4 in) stroke 90 bhp (67 kW) 2660 cc I4 engines and manual transmission as the standard production A90, but the transmission was modified to be a three-speed unit with overdrive on second and top. Girling 11 in (279.4 mm) drum brakes were fitted all round. The suspension used modified Austin A90 components in order to be as cost effective as possible, steering was by Austin's worm and peg system. Front suspension was independent, double wishbone using coil springs and at the rear a rigid axle with semi elliptic leaf springs. A BN1 tested by The Motor magazine in 1953 had a top speed of 106 mph (171 km/h) and could accelerate from 0–60 mph (97 km/h) in 11.2 seconds. A fuel consumption of 22.5 miles per imperial gallon (12.6 L/100 km; 18.7 mpg‑US) was recorded. The test car cost £1063 including taxes. A total of 10030 BN1s were built from May 1953 until replaced by the BN2 model in August 1955. A 1954 BN1 (chassis #446766*4) is on permanent display in the Bonneville Salt Flats exhibit at the Simeone Foundation Automotive Museum in Philadelphia, PA, USA. The 100M components (including the high compression pistons) were also available as the Le Mans Engine Modification Kit, which could be installed in either a BN1 or BN2 with the engine in situ, improving the power output to approximately 100 bhp (75 kW) at 4500 rpm. The kit could be ordered from BMC, allowing private owners to make their own modifications. Many BN-2 and 100-M Austin Healeys compete in vintage events like the Pittsburgh Vintage Gran Prix. An unrestored works racing team 1953 Austin-Healey '100S' Special Test Car that had been campaigned by factory drivers Lance Macklin, Gordon Wilkins and Marcel Becquart, sold for a world record £843,000 ($1,323,915) 1 December 2011, at Bonhams' December Sale. This car was involved in the 1955 Le Mans disaster, motor racing's most lethal crash—in which 84 people died and 120 were injured. Driver David Shale raced an Austin Healey 100S. It is known that Shale gained at least 13 podium finishes in the car, coming 1st in 4 of those races. "EVV", as the car is colloquially known, sold for £673,500 at the Bonhams Goodwood Festival of Speed auction on 27 June 2014. The Austin-Healey 100 was the first of three cars later called the Big Healeys to distinguish them from the later and much smaller Austin-Healey Sprite. It was followed by the Austin-Healey 100-6 and then the Austin-Healey 3000. Despite its name similarity, the Austin-Healey 100-6 has more in common with the subsequent Austin-Healey 3000 than with the original Austin-Healey 100, both mechanically and in appearance. In 1956, a major redesign saw the wheelbase lengthened, redesigned bodywork with a fixed windshield and two occasional seats added (which in 1958 became an option with the introduction of the two-seat BN6 produced in parallel with the 2+2 BN4), and the powertrain completely replaced by one based on the six-cylinder BMC C-Series engine. In 1959, the engine capacity was increased from 2.6 to 2.9 litres and the car renamed the Austin-Healey 3000. Both 2-seat and 2+2 variants were offered. The 3000 was produced in three Marks and four model designations. Production continued until 1968, and accounted for about 60 per cent of all the Big Healeys produced. The Austin Healey 100 in BN1 and BN2 models, four cylinder format has done very well in vintage racing. The stock BN2 can produce 100bhp, hence the "100", however in 100M spec, see above, the larger carburetors, high lift cam and slightly less dished pistons (higher compression) the car can produce up to 110bhp. Some simple modifications, lightening, by removal of the bumpers, interior trim and carpets, the 100 can be quite nimble on racing circuits around the world. Aluminum alloy wheels will accommodate wider and lower profile tires that can lower the center of gravity providing additional stability in corners. Alloy wheels become almost essential as the performance of the car increases and the old wire wheels especially the original 48 spoke wheels become a weak point in the structure. Fortunately there are several suppliers that provide "Mini-lite" and "Panasport" style wheels which are close to period correct. 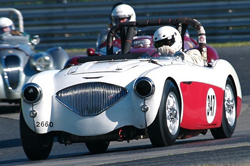 Significantly modified four cylinder Healey 100's can provide exceptional performance, competing side by side with six cylinder Aston Martins and even 12 cylinder Ferrari's of the same era in vintage events. Shown on the right is the Austin Healey Number 347 driven by Rich Maloumian. This car has been campaigned to great success winning at Lime Rock Historic, Pittsburgh Vintage GP and Watkins Glen. ^ a b c d Culshaw; Horrobin (1974). Complete Catalogue of British Cars. London: Macmillan. ISBN 0-333-16689-2. ^ Anderson, Gary; Moment, Roger (2000). Austin-Healey 100, 100–6, 3000 Restoration Guide. Osceola, WI: MBI Publishing Company. p. Back Cover. ISBN 0-7603-0673-7. Retrieved 28 August 2010. ^ a b Robson, G. (2006). A-Z of British Cars 1945–1980. Devon, UK: Herridge Books. ISBN 0-9541063-9-3. ^ "The Austin-Healey "Hundred" Road Test". The Motor. 16 September 1953. ^ a b c Clausager, Anders Ditlev (11 May 2002). Original Austin-Healey 100, 100-Six and 3000. MotorBooks/MBI Publishing Company. p. 48. ISBN 978-0-7603-1225-4. Retrieved 19 March 2010. ^ Simeone, Frederick. "1954 Austin Healey 100-4 BN1". Simeone Foundation Automotive Museum. Retrieved 12 March 2015. ^ Clausager 2002, p. 41. ^ Clausager 2002, p. 43. Ray Bonds (2003). The Illustrated Directory of Sports Cars. Motorbooks. ISBN 0-7603-1420-9. Holmes, Mark (2007). Ultimate Convertibles: Roofless Beauty. London: Kandour. pp. 20–23. ISBN 978-1-905741-62-5. Wikimedia Commons has media related to Austin-Healey 100.